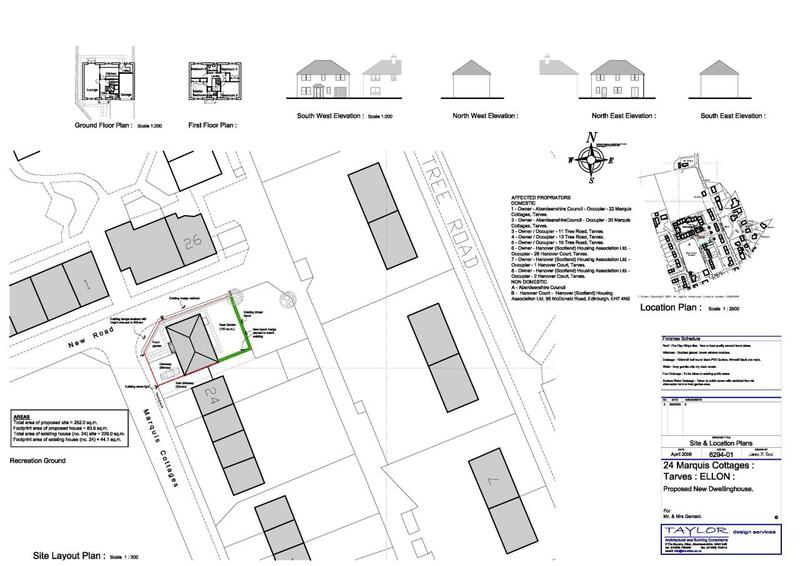 Plot app 252 sq m with planning permission for a detached dwellhouse. Fixed price £80,000 Entry by arr. Viewing Mr & Mrs Gerrard 07437 574543 or contact solicitors. This sizeable plot extending to 252.0 sq. m or thereby with the proposed house extending to 83.9 sq. m had full planning permission for the erection of a detached four bedroom dwellinghouse with garage. On completion the accommodation will comprise on the ground floor, lounge, kitchen, utility room and shower room, with four bedrooms one, en-suite and a family bathroom on the first floor. Planning under Reference Number APP/2008/1919. LOCATION Tarves is a pleasant rural village with a strong community spirit. The village has a hotel, shops and an excellent primary school. Secondary education is provided at Meldrum Academy some 7 miles distant. The village is within easy commuting distance of Aberdeen, Dyce Airport and the Industrial Estates at both Dyce and the Bridge of Don. SERVICES Given the village location, mains services are believed to be readily available close to the site. Offers : All offers should be submitted in writing to our Oldmeldrum Office. LOCATION From Oldmeldrum Square, travel to the roundabout at Meldrum House and turn right onto the Methlick Road. Continue along this road and take the road to the right signposted Craigdam/Tarves. Follow this road until you reach Tarves and turn left at the school, turn right at the end of the park then left again and the building plot is clearly identified by our sign.